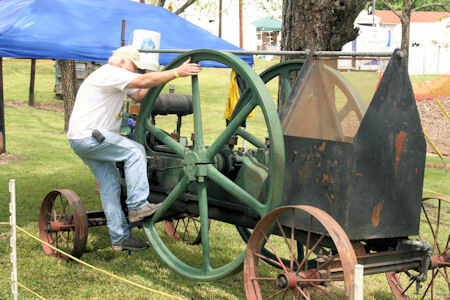 The third weekend in April for the past 25+ years Burton, Texas has had the Burton Cotton Gin Festival. It has been on my list of events to attend every since I heard about it a few years ago. This year I put it on my calendar early. As luck would have it the year I decided to go the Festival it had record setting rains. Rain or shine there was still plenty to see and do. So much so that I didn't get to see and do it all. 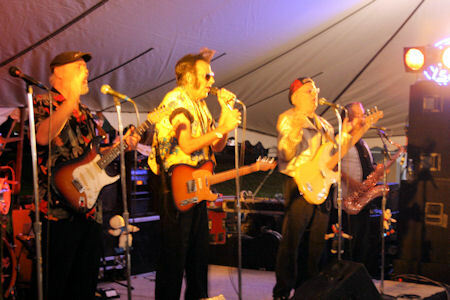 On Friday we enjoyed the music of Johnny Dee & The Rocket 88's. That was a lot of fun. Most of the people dancing were older than I am and that's saying something. Johnny Dee puts on a great show. The Saturday morning schedule was limited because of heavy rains but we enjoyed sitting on the porch of the Burton Gin Museum and visiting with the other festival visitors and the festival staff wringing their hands over rain and schedule changes. In the afternoon the rain had let up and they fired up "The Lady 'B'". That's the engine that runs the entire Burton Cotton Gin. The center piece of the Burton Cotton Gin Festival. Every year the Festival gins one bale of cotton and I had the pleasure of being on the deck when they rolled out the bale, weighed it and pushed out on the loading dock. This year the seed cotton was grown and provided to the festival by 80 year old Gilbert Janner. Also present as Mr. Janner weighed the bale were several members of his family including his 3 year old great grand son. It was truly the highlight of my visit to Burton. 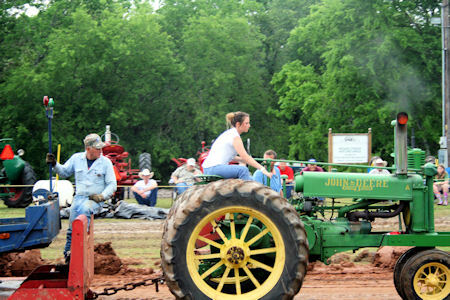 Later Saturday afternoon, after much work on the track, the antique tractor pull began in earnest. Many festival attendees come just for this event. I've been several county fairs and a goat roping or two but I don't think I've ever been to an antique tractor pull. From outsider view looking in there is one thing that I observed, bright shiny paint does not necessarily out pull a rusty tractor with a strong engine and gear box. Saturday night closed with a big dance with a couple of good bands but I was to tired (old) to hang around so I called it a day. Sunday afternoon was a sun shiny day and many of the activities planned for pervious days were open and active. The folk life demonstrations were in full swing with spinners, weavers, lace makers and a of course in Texas you have to have a blacksmith. The tractors were still pulling that sled down the track. I'm not really sure that they ever stopped from Saturday night. ...and of course there was music. Because of all the rain and the fact that Mr. Janner knows how to get a lot of cotton out of an acre of land, they fired up the cotton gin again and baled another bale of cotton. The Burton Gin makes very special cotton bales. Each bale is 500 pounds of air blown, jute cloth covered, steel banned Texas cotton, just like they did it in the good old days. It's my understanding that these cotton bales are auctioned off at the Burton Barn Dance and Dinner each October, if you just have to have one. Even with the rains there were many things that were going on that I have not mentioned. There were various arts and craft vendors, children's activities and food. But most of all there were the friendly people of Burton, Texas.